At Brighton Modelworld recently I spent two days weathering some freight cars with much interaction from the public. 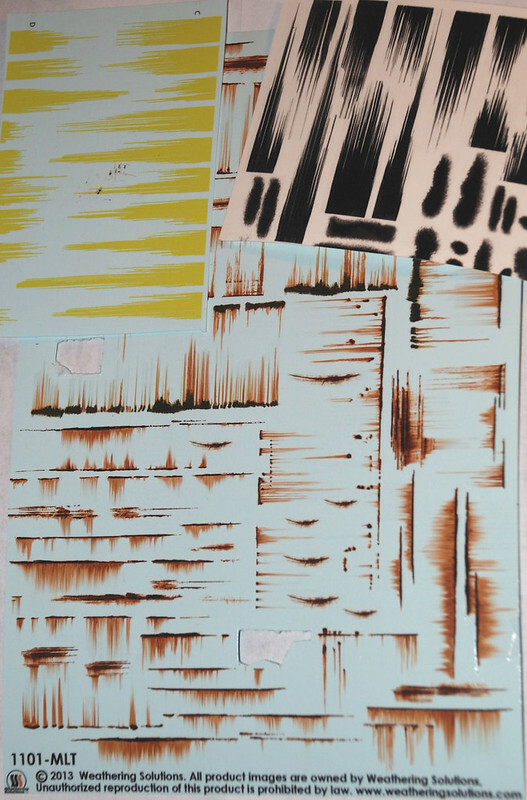 But there was some interesting interaction from fellow member Bob Norris who asked if had heard of some new decals on the marketplace that recreate rust streaks and spots. A bit of surfing and I found them, Weathering Solutions - their website can be found at http://www.weatheringsolutions.com/. 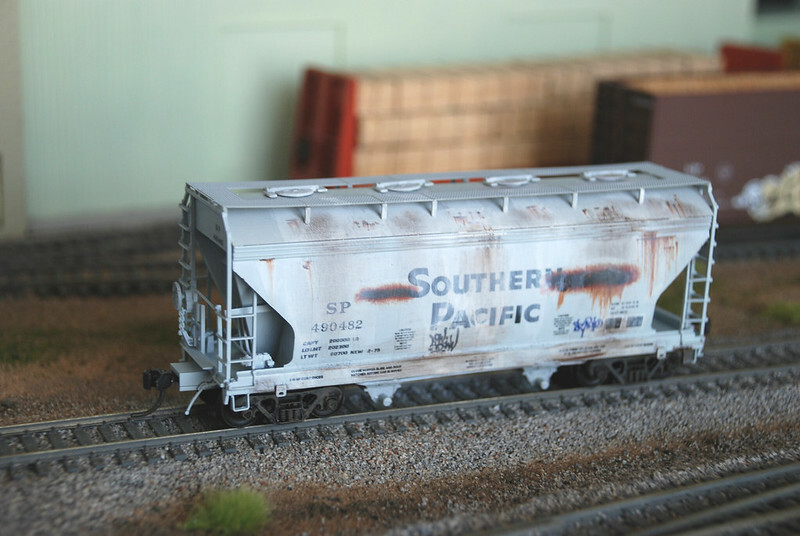 Founded in 2013 they have been developing since July last year a range of products that can only enhance the realistic look of freight cars and structures. 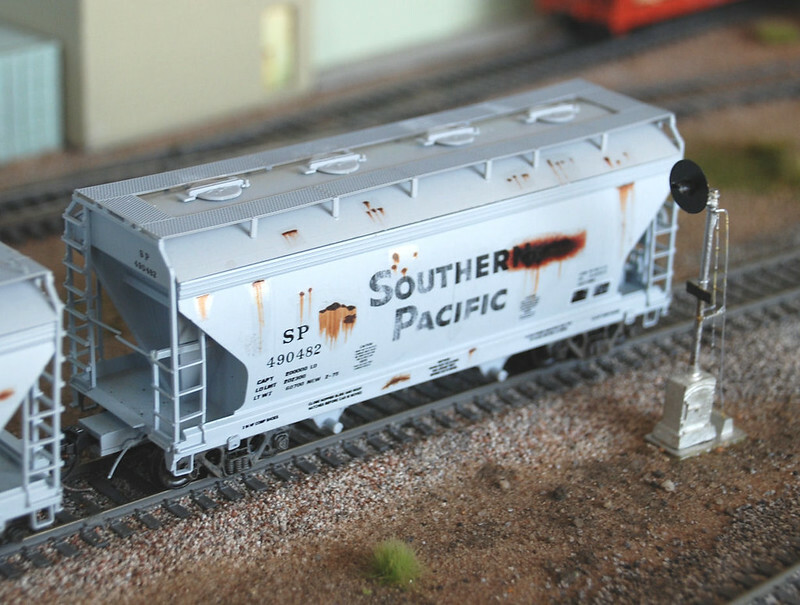 They have rust spots, scrapes and streaks (the latter in two shades) for freight car sides and roof panels of box cars and autoracks, plus industrial streaks for oil, cement, flour and sulphur spills and leakages and graffiti. They produce all in two sizes for HO and N and a few for O. The photos show sheets of rust scrapes/streaks with some sulphur and oil spills at top and rust spots and an example of the graffitti below. Now I love weathering with dry brush acrylics and enamels and powders but this was eye opening. I have admired Pelle Soeborg’s work but could never really master the creation of rust spots and scrapes the way he did them. 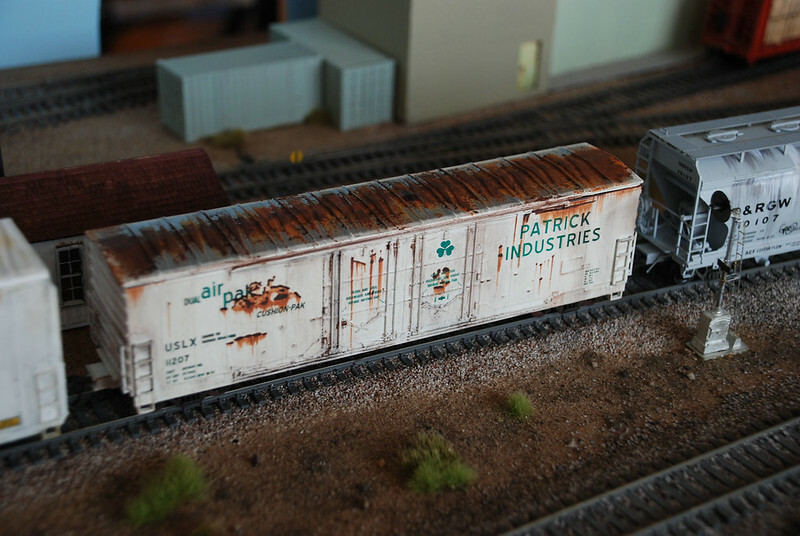 Weathering Solutions have the…...weathering solutions. I have road tested these new products on some cars - a rather tired Evans 54’ box car and a couple of ACF 2-bay hoppers for cement. The decals come with full instructions for successful application and optimum results. They have a satin gloss sheen finish to them so they will need to be varnished with Dullcote or similar after they have dried and hardened in place. You have to cut each item out separately - they come on a continuous carrier film so be careful as many items are interlocking for optimum print capacity. They like warm water for a soaking first and slide easily into place. You just need a good eye to know where to place them for best effect and some Microsol to help them bed down over detail such as seams and rivets. 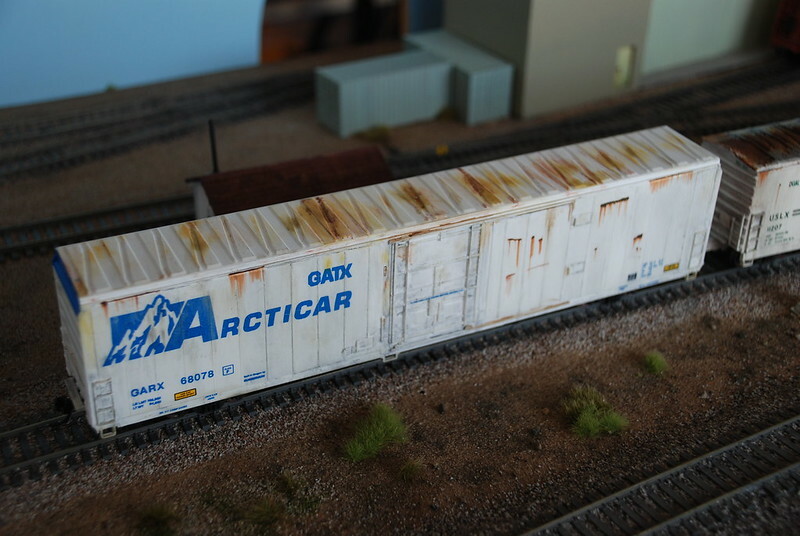 First up was the boxcar which had already been weathered to an extent but had no rusts spots, scrapes or runs on the sides. From looking at photos of the prototypes cars these ones by Evans seem to be rust buckets in whatever colours they ran so are ripe for this challenge. Just browse the decals sheets and look for some prime candidates to go on the car - I applied a combination of scrapes and rust spots and added some streaks down from the gutter lines.. I could add more, a lot more, especially roof to floor rust streaks either side of the door openings. The 2-bay hoppers were different. 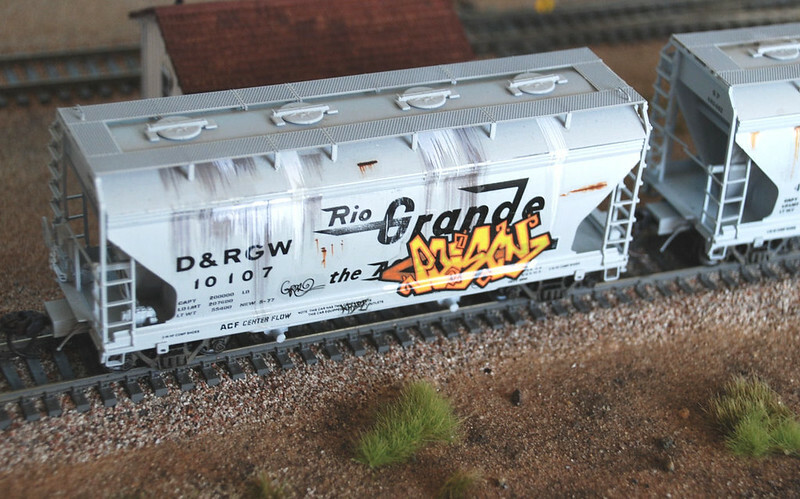 A surf around railcarphotos.com produced some good shots of DRGW and SP examples, one SP one showing bad rusting across its curved side and sloping top sheet and a DRGW that was generally crudded with spilled cement mix of varying shades of grey. You can be very artistic in applying these decals but always look for photos of the real thing as your guide. There is nothing better than Mother Nature for inspiration. The DRGW car used some of the grey and white streaks for cement spillage, the grey applied first and some white overlapping on top. I applied short splashes beneath the walkway on the top sheet and longer ones from the transverse ribs down the side in line roughly with the hatches. A bit of graffiti was added along the bottom for good effect. The SP car photos show both sides, the upper one with decals added before further weathering with washes and powders, the lower one in a virtually completed form with everything blended together and partly obscured under a layer of cement slurry/powder. I had great fun finding small rust patches to apply to the shoulder of the car below the walkway. The lettering was lightly distressed with wet and dry sand paper. 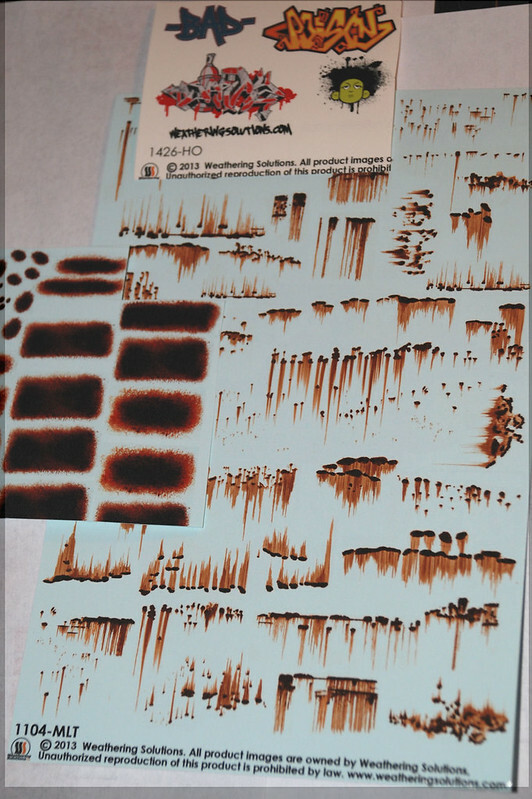 At $6.99 a sheet for the rust and muck decals (they are the same size as Microscale) I think they represent very good value for those patches that everyone will find difficult to reproduce with paint alone. I think the spots and scrapes are especially effective and I shall be ordering some more. All mine are HO but I think that N scale ones would be just as good to give you more flexibility on size and location of the effects you are looking to achieve. Overall I am very impressed with the decals - very easy to use and very fine carrier film but not so fine that they break up when sliding into position. I had no problems with them no matter how long and thin some were. Take a look at your freight car fleet and spot some cars that would benefit from a bit of ageing. There are no suppliers of these decals in Europe at present but you can order direct from Weathering Solutions - mine took just four days to arrive from St Louis!